The usual tuning last for the 4A-GE includes for the most part, headers, muffler, exhaust, hi-profile cams, high comp pistons... But have you considered carburetors? Here's a look at the classic but effective form of 4A-GE induction. 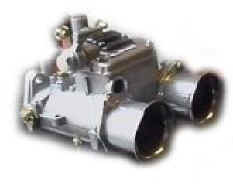 When one thinks of high performance carburetion applications, we tend to imagine funneled intake making that nice classic induction noise... A Solex carburetor, more recently better known as Mikuni-Solex has it's origins in France, and later licensed for Mikuni Japan. It's merit however, isn't just in that orchestrated growl that we've all come to known. One of the major advantages in using the carburetors is in it's throttle response. This is more apparent in the racing field where no filters or collectors are used in the intake. 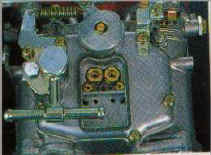 Also, compared to the single throttle injection, the Mikuni and Weber style side-draft uses dual, 2 barrel throttles for a total of 4 individual throttle mechanisms to mix the fuel and air with more control and immediacy, resulting in a positive production of gasoline/air mixture, and in turn making potentially more torque than single throttle. As you may know, there are 4 throttle, fuel injection mechanism too. And the resulting principle is similar. The two systems do have very similar, and distinct advantage over the single throttle setup. The later model OEM 20 valve 4A-GE engines utilize the latter, 4 individual throttle, which we'll cover elsewhere in this website. So, what's so hot about using carburetors? First of all, carburetors need no intervention of ECU's which can be both expensive and in most cases limited in adjustability, unless expensive alternatives like those programmable variety is in your budget. Although it takes some practice, setting a carburetor can be as simple as changing the jets and monitoring air/ fuel ratios. The goal is to match the jets within the carburetors to the required spray pattern and volume to desired mixture at a given rpm and vacuum. There are usually main jets and sub jets for various compensation, both of which have to be manually setup. Third and my favorite reason for the carburetors is the esthetics... The setup simply looks really nice!!!! and it sounds mean! Once an addict, you'll never go back. So why don't you install them right away? Well, there are some stuff you should be aware before you jump in. Since carburetors work with very narrow, optimized range, the more you set it for peak performance in one area, the more you will run into substandard operation in other areas. For example, the carburetors cannot compensate for difference in gasoline or effects of climatic temperatures and pressures on it's own. This adjustment is left to the owner to re-adjust each time. Though Mikuni's and other carburetors do operate very well in most conditions, the fuel delivery under many different conditions is usually much more accurate with modern electronic fuel injection. And usually much more efficient. For those who likes to tinker or wants optimum mixtures for a narrowly focused field, this can be much fun. Certainly, you will get attention from those not so inclined when you fiddle with carburetors on the spot and get good results. Race mechanics are often admired for such talent and gets gratification from that alone. But at the same time, it's certainly a chore for those who likes to me free of maintenance tasks or depend on it to commute every day. You must be frequently prepared to re-jet them or make adjustments when weather changes dramatically. For sure, those who live in areas with drastic seasonal climate changes will have to make adjustments all throughout the year, to keep it in top shape, and sometimes even just to start the engine. Ceased production in 1998, Mikuni is still widely available. One of the best all around units for it's drivability and performance. It may be the best all-around carburetors for use on daily driven vehicles. Kits are still available for the 4A-GE's and one of the easiest to setup. Definitely recommended for the first-timer. Increasing in popularity as Mikuni's becoming harder to obtain, the Weber is an excellent carburetor with very accurate fuel delivery at higher rpm. Mechanically, it is easy to set and parts are widely accessible. 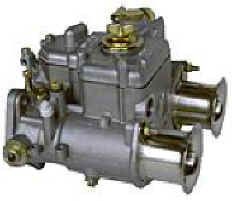 Manifolds for the 4A-GE are widely available also. The Weber is also referenced by host of guidebooks so it's another recommendation for first-time users. The Weber's other advantage, especially over the Mikuni-Solex is it's design of the float, making the carburetors less prone to mixture changes in cornering and braking loads. It's a little bit more nervous and unstable than the Mikuni-Solex over wide rpm ranges. The jets are available in smaller increments than Mikuni. 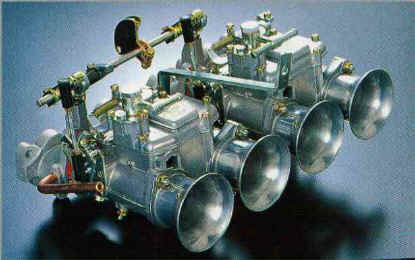 Used by TRD for AE86 racing in the 80's, the Dellorto is an excellent alternative to Webers for racing use. It's a bit finicky for street use but what else do you expect from anything that comes from Italy... It's fun and full of character. 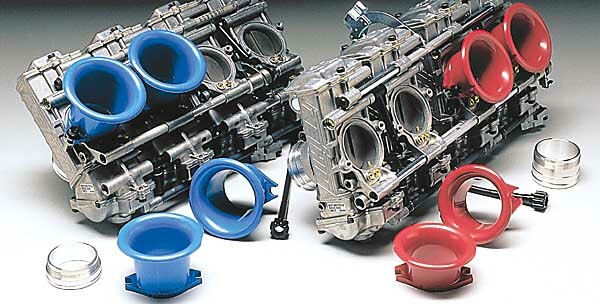 A current trend in Japan for 4A-GE use, Keihin's Flat Slide FCR 41mm carburetor was developed utilizing advanced Keihin Slide Valve technology achieved from 25 years of racing involvement. The FCR features include a progressive dual link throttle linkage for improved valve control enabling stable low- throttle operation. The short venturi length offers quick response. These carburetors are producing very high horsepower rating on the 4A-GE and still has a nice ability to stabilize the mid range even with the use of highly aggressive cam profiles. The intake charge has less turbulence compared with butterfly-type venturi and is the carburetor of choice today in Japanese hobbyists. The FCR's ability to resist miscalibration during cornering G's is unequalled, making use of it's motocycle heritage. The following section was submitted by Richard White, an expert data reference collected by a serious local 4A-GE enthusiast... enjoy! I know you have stated that you are in the process of putting together an article about side draft carbs for the 4A-G. For Christmas I got this book, How to build & power tune Weber & Dellorto DCOE & DHLA Carburetors, by Des Hammill, 1999. If you do not already have it, it appears to be a good reference source for those interested in this subject. At any rate, I would like to pass on what looks to be some key information on this subject. I have tried to summarize some of the key points and the many combinations of components that would most pertain to the 4A-G. I hope it can be of use to your article. Even in this day of high technology electronic fuel injections, simple carburetors that give high performance while basically being a bolt-on item are on a cost-for-cost basis that can give ï¿½unrivaled valueï¿½ for the money (especially if good second-hand carbs. are purchased). In carbs, bigger is not necessary better. Most engines that do not run well have chokes, main jets, accelerator pump discharge jets and/or fuel pressure that are too large for the engine, and running conditions. It is not possible to tune an engine that has some mechanical problem. Well built engines respond perfectly to correctly tuned side drafts. Electronic Injection vs. Carbs: Overall, the performance of these injection systems (if correctly set up) is unmatched by any carburetor but the differences between fuel injection and a well tuned side draft can be very small. It is possible that changing to carbs will mean that your car will no longer comply with exhaust emission control or other regulations in your state or country. An increase in engine power and therefore, performance, will mean that your carï¿½s braking and suspension systems will need to be kept in perfect conditions and up rated as appropriated. Engines last a lot longer if the air admitted into the engine is as clean as possible. Always fit the very best filtration system that you can afford to buy. Wire mesh filters over ram stack offer virtually no protection (except from stones) and can actually upset airflow. 1. Short ram tubes are usually used for high rpm applications. 2. Longer rams are usually used to maximize mid-range response. Webers/Dellortos require high fuel volume not high fuel pressure, i.e., 1.5 to 2.5 pounds per square inch. When tuning your engine the cost of buying parts has to be balanced against the actual cost of getting a specialist firm to carry out this work. It is possible to spend a considerable amount of money on jets, chokes, etc. (new or second-hand) that you will end up not using. Very small choke sizes in large bodies is not a good idea. Overall recommendation: Fit the smallest choke that will give full power. When a slight choke size reduction is necessary to achieve better low end performance (eg: out of a corner pulling power) then fit a choke size that proves best for the overall application. Once the carburetors have been set-up to give optimum performance, youï¿½ll still need to check them occasionally to keep them working at their best. Check throttle spindle synchronization, float level, idle mixture and change fuel filter at regular intervals. 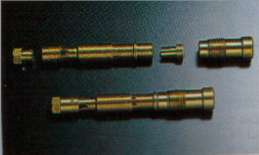 Main jet recommendations with ideal choke size: 135: 400cc per cylinder. Note, over rich mixtures washes the oil film off the cylinder bores and causes high cylinder wear. If the air corrector is too lean (large dia.) 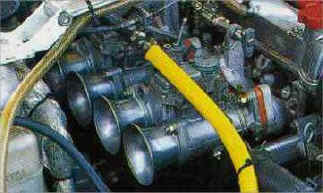 the engine will miss as it nears max rpm, and if too rich (small dia.) the engine will not produce optimum power. Note: Weber uses a totally different shape of auxiliary venturi for the 40 DCOE as compared to the 45. Beware of this fact when ordering auxiliary venturis. Accelerator pump Jet: 40s on the high side, 35s on the low. Find by trial and error the smallest pump jet that gives the best performance. Even with long duration camshafts it is possible to have smooth acceleration from quite low rpm in high gear (full load) without any ï¿½spitting backï¿½ or engine hesitation. The needle valve has to be large enough to keep up with the fuel demand of the engine, however , it should not be larger than is necessary. * Standard 4A-G, distributor equipped, with 15ï¿½ of idle speed advance BTDC and 32ï¿½ of total advance, BTDC, and no vacuum advance. 7.5mm fuel shut off height and 15mm full droop float setting.